It’s been three years since I’ve been back to my hometown, Juneau, Alaska. My relationship to Juneau is complicated. I wrote about its formative qualities in the early part of my spiritual biography. I’ve never been away from Juneau for this long. It’s as if I have new eyes, and yet my senses remember: the way the water smells here, the feel of this beach, my legs know how to respond to the sea, my eyes know how to spot whales and eagles at 300 yards, my ears recognize the wake of the cruise ships and the sighs of the whales as they come up to breathe. The one question I have is what the hell the crows are talking about. My parents’ property is overrun with crows. It’s the worst it’s been in 15 years, they say. The crows are eating all their lettuce in the garden; the broccoli is entirely pecked to death. The crows yammer from morning until night – which here is about 3am (yes, I woke to the first birds chirping, at 3am precisely) until twilight, about 11pm. I have no idea when they sleep. There are very few ravens out here on the island this year. But they are in town – hovering around parking lots and on lampposts. In Wales I was hard pressed to tell the difference between ravens and crows without a good hard stare (beaks are different, and the shapes of the feathers). Here, the ravens are massive. A few people in Wales tried to convince me that ravens were large, but oh no. The ravens here are 2-3 times the size of crows. If a raven and I have to face off, the raven always wins. That people groups around the world revere them and connect them to strong forces (The Morrigan of Ireland and the Trickster figure in Pacific North West Coast Native traditions immediately come to mind) is no surprise at all. Sitting out on the beach, feeling the wind, watching the water, smelling the air, retraining my eyes to the myriad different shades of green and grey, I am struck how unmagical it is out here. That’s an odd thought coming from me! I mean, of course it’s magical – how could such natural beauty not be magical? Yet, there is a lack of mysticism. The land is too rough, too wild to be mystical, at least in a Western Mystical Tradition sort of way. There is something more primal and wild, less rational and thought through out here. Any magic gained here comes from listening, watching, and getting dirty. My senses may be attuned to this place, but listening? I’m out of practice with these particular languages. The kind of magic that exists here, the first magic I ever knew, is not even so much ‘magic’ as it is interconnectedness. My father, one of the least religious people I know, is perhaps the high priest of this kind of magic. I don’t think he views it like this, but he knows this land like the back of his hand. I know that’s a weak cliché, and yet….. I mean it. He knows the trees, the plants, the fish, which type of fish heads attract the most and best crabs. It comes with a lifetime of paying attention and getting one’s hands dirty. Coming back here I realize how much I know about this place wherein I no longer live, but also how much I don’t know or understand about this place. And that reminds me of how much I have to learn about my new adopted home in Washington State. I want more of this kind of ‘magic’ in my life. I know it’s the kind that comes slowly, over years, not just seasons. Pass up no opportunity to explore, watch, listen, feel. Fear not any weather or landscape. Sometimes I wonder about the other forms of magic. Some kinds I’ve experienced myself, other kinds I wait to experience. But this kind, this primal interconnectedness is a form I know exists. It is the touchstone I return to, much like Alaska itself. It is like a mother to me: I go out confidently into the world, knowing that I can always return if I need to. 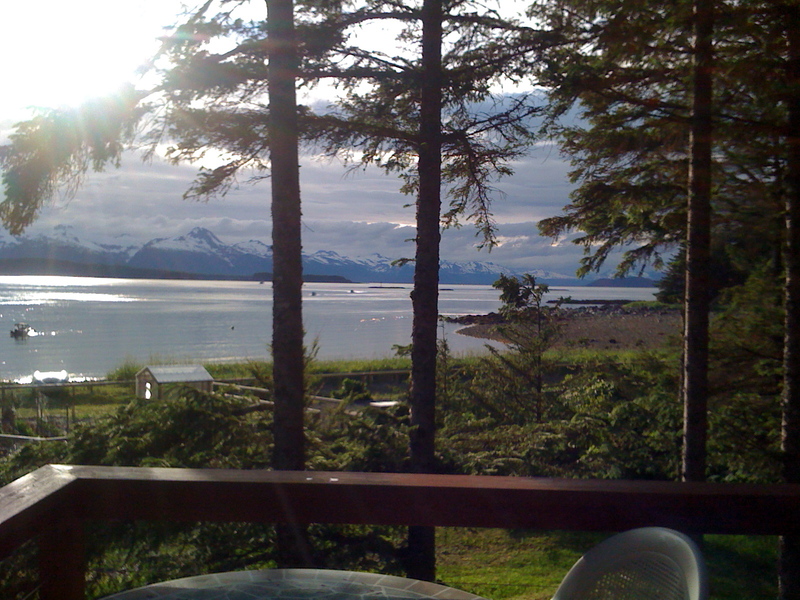 This entry was posted in Uncategorized and tagged Alaska, land, magic, Place. Bookmark the permalink. As always, aninsightful post from you. I love our Alaskan ravens. I miss those guys. Alaskan ravens are incredible. Pretty much everything in Alaska is bigger and More So. And a very happy birthday to you!